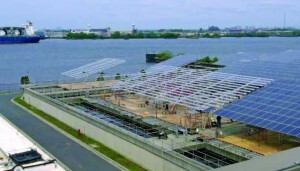 Camden County Municipal Utilities Authority in New Jersey is one entity that has enabled solar energy with construction of a solar project at its Camden wastewater treatment plant.1 The project entered its planning phase in 2011 and construction of the solar energy system began in January 2012. groSolar, a national leader in solar engineering and construction, was approached by the project’s developer HelioSage to engineer and build the system once the site had been identified. Unlike other projects, the Camden solar project overcame several site specific challenges due to the obvious lack of land or roof space. 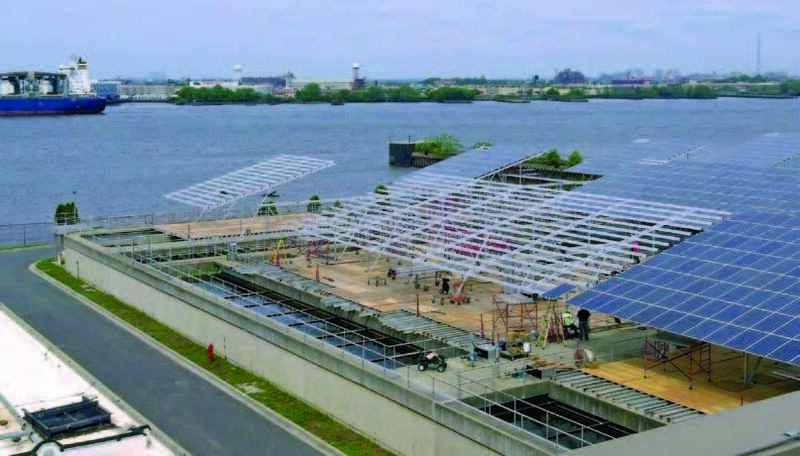 As a result, groSolar designed a system to place solar panels on a canopy-style mounting structure that spans six acres of open wastewater treatment tanks. 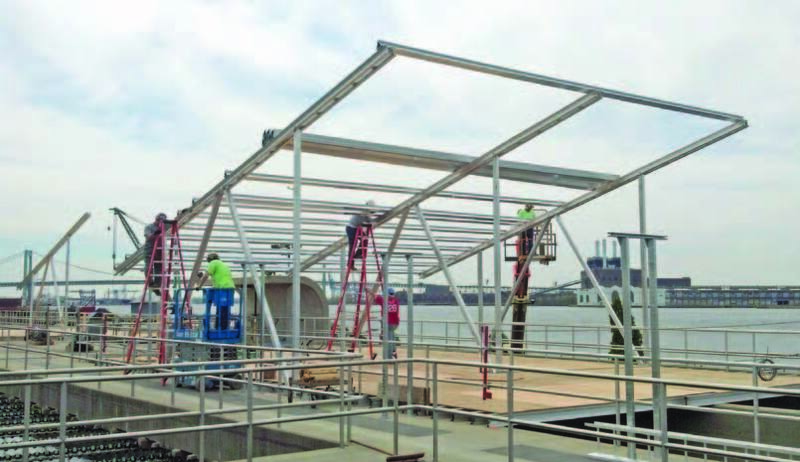 To allow workers to operate safely, temporary wooden decking was used to span the tanks, while aluminum racking was in-stalled over the tank walls and solar panels were secured on top. As the workers moved from tank to tank, they would position the wooden decking in advance. With safety is-sues resolved, workers then installed Schletter Modiἀed Carport Racking to hold the more than 7,200 250-watt PV panels; SMA inverters were installed in a location adjacent to the open tanks. 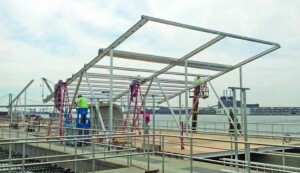 “Many precautions had to be taken and there was strong cooperation amongst groSolar, the CCMUA and the several subcontractors involved in the project,” said Resor, noting it was important material handling and construction be carefully coordinated. The first of three systems began producing energy in May 2012 and the entire project was commissioned in June. The completed installation is producing at a rate of approximately 2.2 million kilowatt-hours of electricity per year, enough to meet the needs of more than 400 homes. 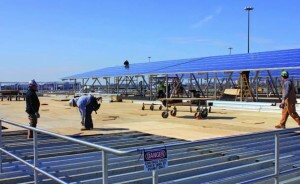 Due to its complexity, the project has been nominated for the 2012 PV America East Photovoltaic Project of Distinction Award. Beyond its complexity, the project has also highlighted another benefit of solar energy: an ability to use space that would have otherwise gone unused. For municipalities considering solar projects, there are a wide variety of design options available to fit each case’s specific requirements. For instance, groSolar has completed projects in the residential, commercial, industrial, utilities, education, nonprofit and governmental/public sectors. They have constructed solar systems in areas from 30-acre fields to rooftops to public parking areas. These projects have been completed in states from the East Coast to California and in a variety of climates. In addition to the CCMUA project, groSolar constructed a 6MW solar facility for developer Community Energy Solar, named “Keystone Solar” in rural Lancaster County, Pa. 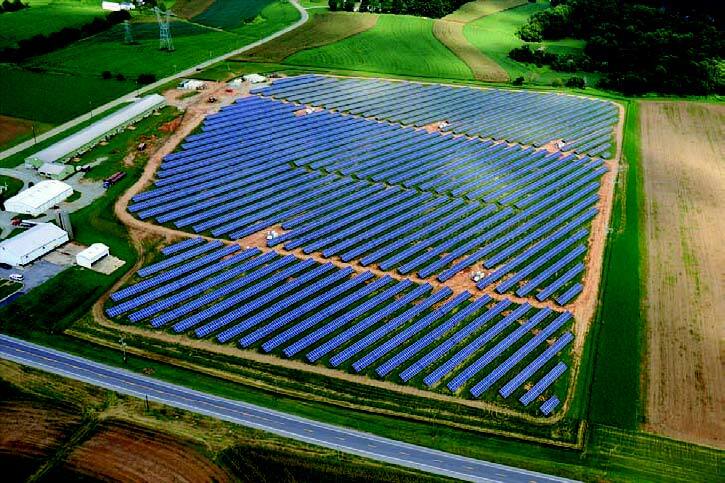 This was the largest solar project in Pennsylvania at the time of its completion and was built in a former cornἀeld. The design and construction were completed to-meet the requirement that the land could be returned to working agricultural use at the end of the project life. Construction began in late-June 2012 with commercial operation following in mid-September. 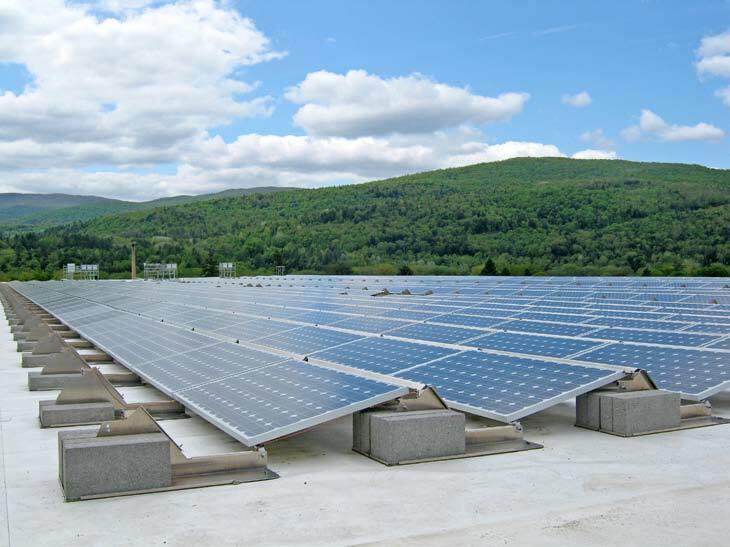 The Green Mountain Coᴀee Roasters’ solar project provides an example of a project that utilized rooftop space. Beyond researching operating systems, municipalities must assess the area where they plan to install the system. Resor described a client who planned to install a solar project on a particular roof; however, after the initial inspection, it was deter-mined the utility connection would not be economical. After assessing other buildings owned by the client, groSolar suggested an alternative location, which was still attractive to the client. Other determining factors depend on municipalities’ locations, since in some cases, the existing energy sources are less expensive than solar options. Another issue which may aᴀect the feasibility of a site is shading from trees or other physical features. CCMUA did not have to expend any capital for the installation of the solar system; instead, a third party investor, Camden So-lar Center LLC, a wholly-owned subsidiary of Integrys Energy Services, provided the capital to pay for the construction and is the project owner. CCMUA simply pays for consumed energy during the term of the agreement. The goal of agreements such as this is for a municipality to purchase energy at a rate projected to provide long-term energy savings. 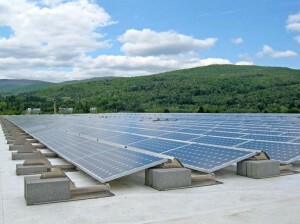 In the case of the Keystone Solar Project, Exelon Generation purchased output under a long term power purchase agreement; additionally, several organizations signed up for a share of the output, including Franklin & Marshall College, Eastern University, Juniata College, Marywood University, Drexel University, Millersville University, Philadelphia Phillies, and the Clean Air Council. Financing for the project came in part from two Pennsylvania grants: the Pennsylvania Energy Development Authority and the Redevelopment Assistance Capital Program. There are many types of solar project opportunities for municipalities. Unlike other energy projects such as gas or coal, solar facilities can be located close to the electric users with the planning and permitting process able to progress more quickly. This results in faster planning and construction periods when compared to conventional power generators. “Solar projects are ones which managers can see through to completion under their near-term watch,” Resor said. “In addition, solar projects provide many other benefits to communities beyond green energy,” Resor stated. For example, these systems can be useful teaching aids with the real time production data from the solar energy system incorporated into schools’ curriculum for math and science.